Thursday, it rained. Friday, it rained. Saturday, it didn’t rain. 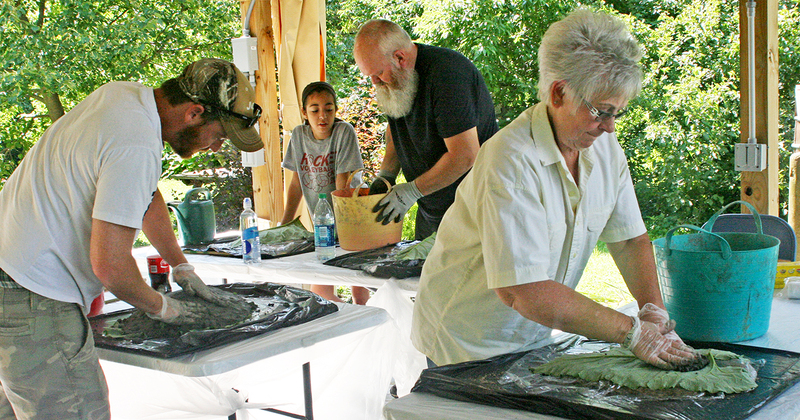 At 10 a.m. on July 11, the clouds were scarce enough that some blue shown through, a good thing for many reasons not the least of which was that 10 people were involved in the annual leaf-making workshop in the Seitz Family Pavilion. Tim, Alex, Bob and Marilyn create their own leaves. 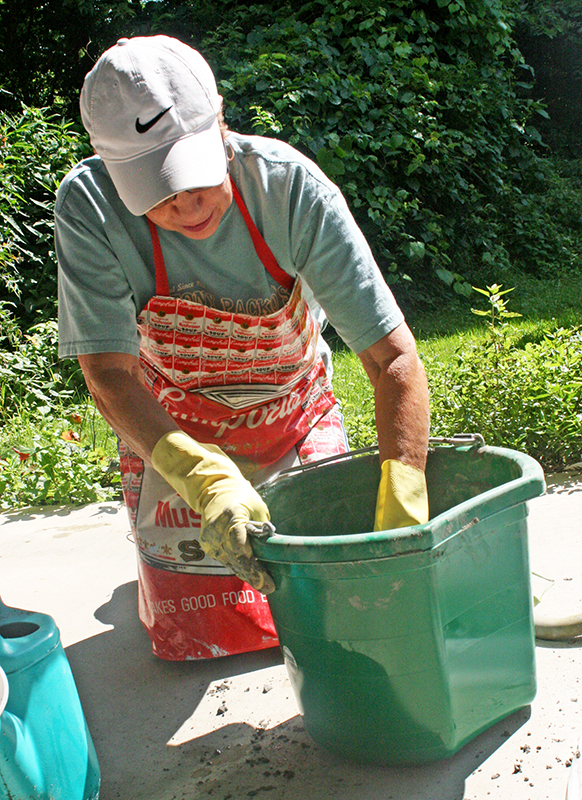 Brenda stirs concrete for her leaf. Because they are large with strong vein definition, burdock leaves are nurtured prior to each summer leaf casting. Two buckets held the giant cut leaves. After play sand was mounded to the shape desired by each leaf maker, the sand mold was covered with plastic cling wrap. The selected leaf topped that and concrete was layered on. Some added river stone or beach glass. 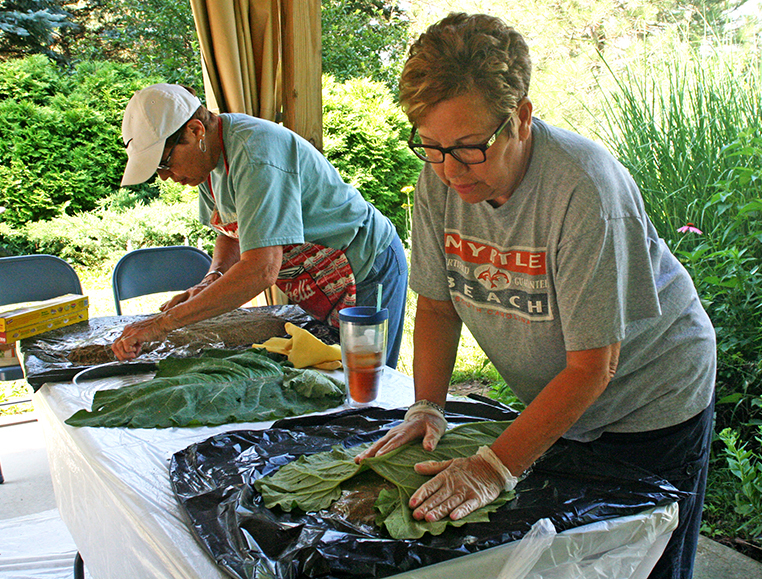 Brenda and Elaine arrange burdock leaves for casting. 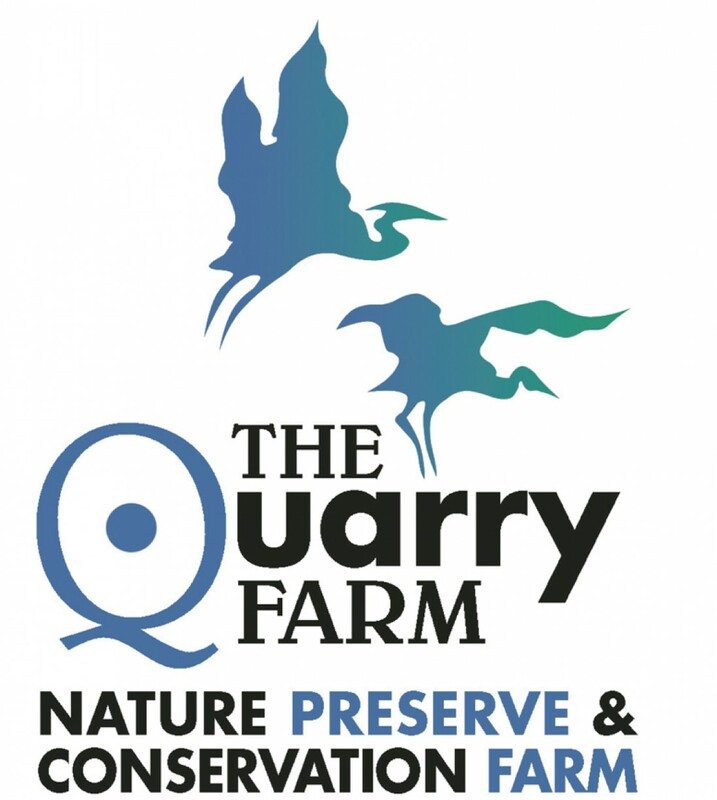 Although everyone walks away from these events with a lasting leaf with which to feed and/or water birds and other wildlife, to use as a garden stepper or to display on a coffee table, we on The Quarry Farm love watching the creative process. And on Saturday, we were the grateful recipients of apples and huge bags of peanuts for the farm animal sanctuary residents, as well as a generous check from the Putnam County Master Gardeners. 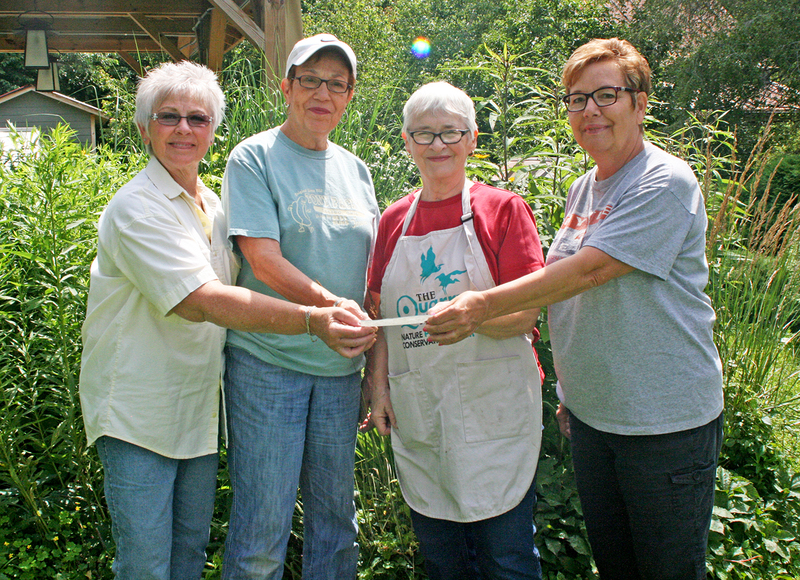 The Putnam County Master Gardeners present a check to Board President Laura. We won’t see the final leaves for a week or so, since the rain picked up again on Sunday and Monday to slow the drying process. But we experience the results of generous support everyday. In fact, I think everyone who shared in Saturday’s experience did as butterflies flitted in and out of the open-air classroom, damselflies and dragonflies nabbed mosquitoes and a little bullfrog sounded off in the full raingarden pond. Oh, and here’s the recipe for those cookie bars that were on the snack table. 2. Press dough into a greased 13 x 9-in. baking pan. Bake 20-25 minutes or until edges begin to brown. Cool completely in pan on a wire rack. 3. In a bowl, beat cream cheese, butter vanilla and salt until blended. Gradually beat in confectioners’ sugar. Spread over top. Sprinkle with more chopped pecans, if desired. Cut into bars before serving. Store in refrigerator. 1. In a small saucepan, melt butter over medium heat and cook, stirring constantly, until butter turns a caramel-brown color. Be careful not to burn. Allow to cool. 2. Combine all ingredients and beat until creamy. Add a little milk, if necessary, to reach spreading consistency.